ASUS VivoBook F510UA FHD Laptop, Intel Core i5-8250U, 8GB RAM, 1TB HDD, USB-C, NanoEdge Display, Fingerprint, Windows 10, Star Gray (F510UA-AH51) is 0.8″ thin. The laptop is very light-weight. The charger is tiny as well, very different than my older laptop’s, which had bulky charger bricks. Responsive. The laptop has the fast 8th generation of i5 Intel Processor, which is one of the selling points, so it starts up very fast, only takes seconds. There is no flex on the keyboard, firm keys, and typing feels comfortable. It does not have backlit feature, but you will have a function key to adjust your screen’s brightness. You have a lot of upgrade possibilities with this ASUS VivoBook F510UA. There is no hatch with this Win 10 Vivobook, you will find 10 visible head screws (Phillips) and 2 hidden screws located behind the pads, very near from the hinge to open your device. 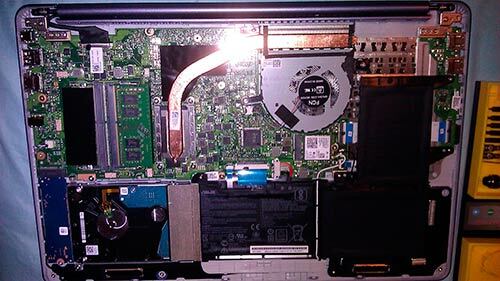 Beware, you must have technical knowledge before you open your laptop, otherwise you can lose your warranty. The 1TB hard drive can be upgraded to a SATA SSD in the same slot location. Then there is an extra M.2 slot, next to the factory HDD that accepts a SATA 3 not NVMe. If you look for similar model with SSD instead of a non-SSD HDD consider this F556UA model. For the memory, there are 2 slots, one is being used by the factory’s 1×8 GB 2400 MHz RAM, and one is empty to add your own. The screen is a matte IPS display, no touchscreen, but a Full-HD. It has a decent brightness, and because it is a matte screen, you can use the laptop indoor or outdoor without getting those screen reflections. It does not have optical drive or DVD drive. But this gives you a super lightweight laptop. The cover of the laptop is all plastic, not aluminium or metal. But if you care more for the performance, you will be OK with this. 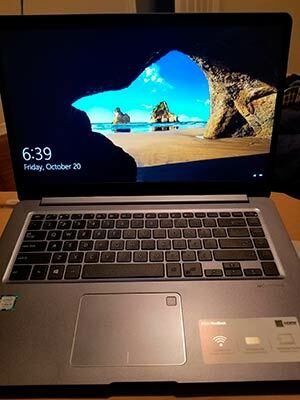 In short, the laptop has performance that is closed to high-end laptops in the market that costs up to 1,000 bucks like this Vivobook M580VD-EB76 model, and very light. So if you are looking for good performance laptop that is light-weight under 500 bucks, I would recommend this laptop. All images above belong to the respective owners, click here for more images of ASUS VivoBook F510UA. I like you article, is very usefull because I get this laptop the last thursday! There are a supported limited for the extra SSD m.2 slot? and if there are, how much is’t? There is one extra m.2 SSD slot. Have fun with your new laptop.